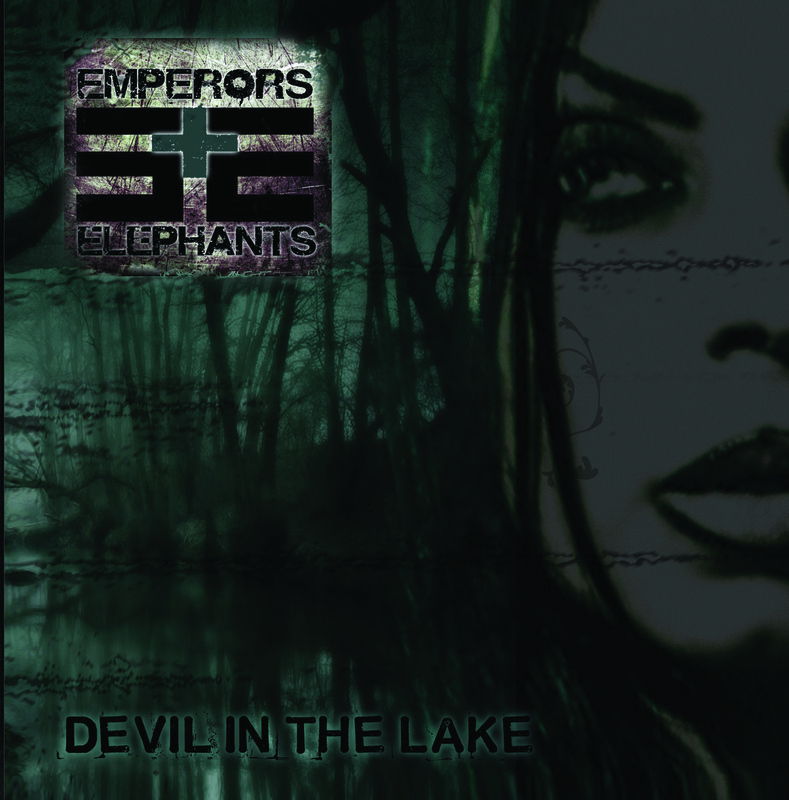 The Rock N’Roll onslaught of 2014 continues with the release of ‘Devil In The Lake’ by Emperors And Elephants. Emperors And Elephants hit my radar when my friend, guitarist Randy Cooper, informed me that he had joined forces with them. I eagerly awaited news from this collaboration and read everything I could find. Now the fruits of their hard work have come to light as they unveil ‘Devil In The Lake’ to the world. I have read other reviews comparing them to this band or that band, there will be none of that here. While you can hear certain influences in the music of Emperors And Elephants they remain unique in their sound. There are elements of Southern Rock riffs to full on blazing Metal. I am not going to list who I feel their influences are I will leave that up to you and your ears. 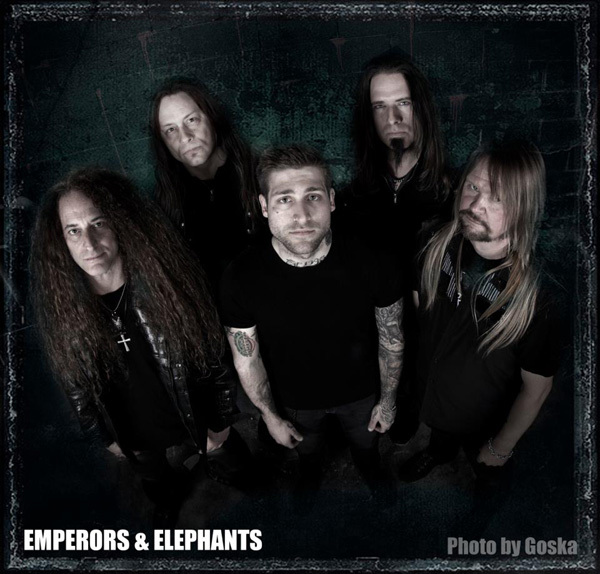 Emperors And Elephants is Jesse Andrews – vocals, Jason Meudt – drums, Jeph Stiph – guitars, Randy “The Arsonist” Cooper – guitars,and Ron “Stoppable”Vanders – bass a truly tight unit built for Rock N’ Roll. ‘Devil In The Lake’ reaches out and sinks its sonic awesomeness into your ears right out of the gate with opening track “Bring It Down”, and by the the time you get to the closing notes of “M.O.G. Dupermang Remix”, you will come to realize you have become infected with the need to listen to the record all over again. The guitar work that is found on ‘Devil In The Lake’ is top-notch. Randy “The Arsonist” Cooper and Jeph Stiph give us some riffage that dreams are made of. Beautiful acoustic, dirty Southern Rock grooves, to ear bleeding shred it’s all here on ‘Devil In The Lake’. Their trade-off licks remind me of some of the great guitar duos of Rock N’ Roll. You can distinctly hear their individual styles on the record though as each show their style of playing. Jesse Andrews vocal work makes me ask “Where the hell has this guy been hiding?” Powerful is an understatement with Jesse on ‘Devil In The Lake’. Clean melodic work to bone rattling screams give your ears delight throughout. One of the things that draws me into a vocalist is the ability to inject emotional feeling into their vocals. Jesse imparts emotion and then some here, you truly feel when you listen to him sing. Ron “Stoppable”Vanders provides the bottom end to Emperors And Elephants on ‘Devil In The Lake’ solid and the style that is needed on a record like this. Ron has the ability to lock into the groove of the song and get your head nodding, in my opinion a good bassist does just that. I love closing my eye and focusing in on the bass lines on this record. The drums of a record are like a heartbeat to me. Jason Meudt gives ‘Devil In The Lake’ its heartbeat and then some. Another thing a bout a record I love is the ability of the drums to accelerate your own heartbeat and get your adrenaline pumping. No needless flashiness here, just some solid Rock N’ Roll drumming. Jason provides the foundation upon which ‘Devil In The Lake’ is built. Clocking in at around 46 minutes the 12 songs on ‘Devil In The Lake’ are all enjoyable, yet there are a few that stand out to me. “Bring It Down”, “Man Of God”, “Deep Sleep”, “Change”, “Ghost In The Mirror” all just have that je ne sais quoi about them. Give them a listen and you” see why. Production wise the ‘Devil In The Lake’ is clean and mean. Levels and clarity are stellar across the board and the CD stands up to being played at levels that will let your neighbors on the block enjoy it as well. My final thoughts on ‘Devil In The Lake’ are this, 2014 is gonna be a great year for Rock N’ Roll music, and bands like Emperors And Elephants are on the font lines leading the charge. This a record that all lovers of straight up, Rock N’ Roll music need in their collection. 15 out of ten stars right here, it’s that good. Thanks Jesse, Jason, Randy, Jeph, and Ron for making a record that is enjoyable start to finish. Now, bring it out on the road! it’s loud, it’s dirty, it’s Emperors And Elephants! This entry was posted in Artist, Bassists, Blues, Classic Metal, Classic Rock, Drummer, Guitarists, Heavy metal, Internet Radio, Metal, Music, Outlaw Metal, Rock, Rock N' Roll, RockStar, Sleaze, Surrealist, Tattoos, Vocalist, Whiskey Metal, Wornstar Clothing and tagged 80's, Bleach Bang, Bleach Bangs, Bleach Bangs Radio, Charlie Owens, Classic Rock, Devil In The Lake, Emperors And Elephants, Hard Rock, Heavy Metal, Jason Meudt, Jeph Stiph, Jesse Andrews, Metal, Music, Pavement Records, Randy "The Arsonist" Cooper, Randy Cooper, Randy Norris, Rock, Rock N' Roll, Rock Star, RockStar, Ron "Stoppable" Vanders, Ron Vanders, the Hellion, the Hellion Rocks. Bookmark the permalink. ← THE GROUND BENEATH UNVEILS ‘SELFTITLED’ AT THE LAUNCHPAD!! !